Download our free Garage Heating Guide! Stepping into a freezing cold garage is never a fun experience. If you’re tired of the cold — and all the inconveniences that come with it — it’s time to explore some garage heating options to keep yourself and your family comfortable year-round. 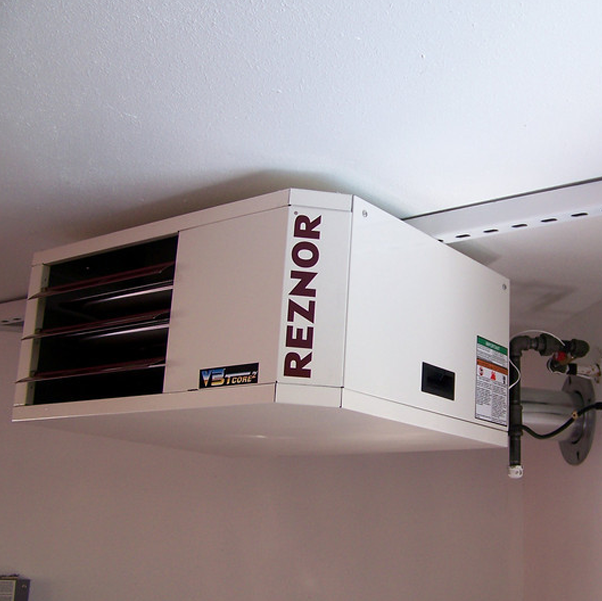 Adding a heater to your garage ensures you make the most of your space. Consider all the possibilities — you could transform your garage into a home gym, a weekend workshop or even a tailgating clubhouse stocked with all your favorite beverages and sports memorabilia. Getting your garage heated is the first step — whatever you decide to do next is up to you. Download your Garage Heater Buying Guide Here! Our free Garage Heating Guide covers everything you need to know about heating a garage, from the types of garage heating options available to finding the right heater for your needs. If you’ve toyed with the idea of buying a garage heating system, but you’re not sure which heater is right for you, we’ve got you covered. We’ll guide you throughout the entire garage heating process, from sizing your system to calculating energy costs. We’ll even give you a glimpse at some of the best garage heaters we offer to help make the shopping process as easy as possible. Adding heating to your garage is essentially like adding another room to your house, without shelling out the cash for an addition. Long gone are the days of bracing yourself against the cold and waiting to warm up your car before heading to work — with a garage heating system, you’ll be ready to go the moment you set foot in your garage! Ready to get started? Download our Garage Heating Guide today!